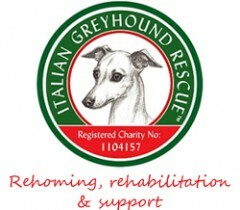 We are the only registered Italian Greyhound Rescue in the UK, we re-home Italian Greyhounds all over the mainland UK. The majority of Italian Greyhounds that we re-home are placed in our care because of changes in their owners’ circumstances which make it impossible for them continue to provide the care their Italian Greyhound needs to live a happy, healthy life. There are of course Italian Greyhounds that come into our care as a result of neglect or abuse and our breed specialist volunteers are well placed to provide the care they need to nurse them back to health and begin to help them re-build their confidence in humans. When someone contacts us to discuss long-term adoption, our only concern is the welfare of the dog moving forwards. We assess each case on a case-by-case basis and develop an individual care plan for each dog. We have a network of approved foster homes that provide short-term care for Italian Greyhounds handed into our care, although most are placed with IGRC trustees who care for the dogs until a suitable home is found. Every one of these foster homes has been through our home check process and all of the carers have experience of living with and caring for Italian Greyhounds. When an Italian Greyhound is handed into our care for long-term adoption, and has been assessed by one of breed specialists, we are able to search our database of potential homes to try to find the best possible adoptive home for the dog. We shortlist potential matches and conduct interviews and home checks to ensure that the IG is placed in the most suitable home for that individual dog. If you are in a situation where you need emergency support , or you think that adoption may be right for your dog please see our ‘Placing an Italian Greyhound into our care‘ section and contact our rescue team who will handle any queries in the strictest of confidence.